The K2 Dyno Replay System is remarkably easy to learn and use. With a highly intuitive touchscreen interface, shuttle knob and Grass Valley T-bar, you'll find creating engaging replays and highlight packages a dream. Sharing content is effortless, based on the K2 media server infrastructure and increased content/metadata integration. K2 Dyno's unique AnySpeed technology dynamically provides the smoothest playback at any speed from 0% to 200%. The DynoZoom tool allows for pan/zoom functions to be applied to high frame-rate camera systems including 3X 1080p, 6X and 4K UHD. *Time for video with four 16-bit audio channels, no ancillary data. Times are estimated and can vary up to ±10%. Please visit www.grassvalley.com/products/k2_summit_3g for complete server specifications. K2 Dyno S Replay Elite Package. Includes K2 Summit 3G 4-channel HD/SD server with DV, MPEG-2, AVC-Intra, and DNxHD codecs, 12 x 480 GB SSD drives in a RAID 10 configuration for storage (50 hours at AVC-Intra 1080i/720p), and K2 Dyno S Replay Controller with application software and AppCenter Elite with ChannelFlex. Supports replay configurations up to 6 camera iso-records and 1 replay out or 4 camera iso-records and 2 replay outputs (program and preview or 2 independent programs.) Also supports up to two 3X speed camera iso-records or three 2X speed camera iso-records (DV, AVC-Intra, and DNxHD codecs only). K2 Dyno S Replay Elite XDCAM Package. Includes K2 Summit 3G 4-channel HD/SD server with DV, MPEG-2, AVC-Intra, and DNxHD codecs, 12 x 900 GB drives in a RAID-10 configuration for storage, and K2 Dyno S Replay Controller with application software. Also includes hardware and software to permit ChannelFlex operations with MPEG-2 formats such as XDCAM and XDCAM HD. Supports replay configurations up to 6 camera iso-records and 1 replay out or 4 camera iso-records and 2 replay outputs (program and preview or 2 independent programs.) Also supports up to two 3X speed camera iso-records or three 2X speed camera iso-records (DV, AVC-Intra, and DNx HD codecs only). K2 Dyno S Replay Elite Package. Includes K2 Summit 3G 4-channel HD/SD server with DV, MPEG‑2, AVC-Intra, and DNxHD codecs, 12 x 900 GB drives in a RAID-10 configuration for storage, and K2 Dyno S Replay Controller with application software. Supports replay configurations up to 6 camera iso-records and 1 replay out or 4 camera iso-records and 2 replay outputs (program and preview or 2 independent programs.) Also supports up to two 3X speed camera iso-records or three 2X speed camera iso-records (DV, AVC-Intra, and DNxHD codecs only). K2 Dyno S Replay Elite XDCAM Package. Includes K2 Summit 3G 4-channel HD/SD server with DV, MPEG-2, AVC-Intra, and DNxHD codecs, 12 x 600 GB drives in a RAID-10 configuration for storage, and K2 Dyno S Replay Controller with application software. Also includes hardware and software to permit ChannelFlex operations with MPEG-2 formats such as XDCAM and XDCAM HD. Supports replay configurations up to 6 camera iso-records and 1 replay out or 4 camera iso-records and 2 replay outputs (program and preview or 2 independent programs.) Also supports up to two 3X speed camera iso-records or three 2X speed camera iso-records (DV, AVC-Intra, and DNxHD codecs only). K2 Dyno S Replay Elite Package. Includes K2 Summit 3G 4-channel HD/SD server with DV, MPEG‑2, AVC-Intra, and DNxHD codecs, 12 x 600 GB drives in a RAID-10 configuration for storage, and K2 Dyno S Replay Controller with application software. Supports replay configurations up to 6 camera iso-records and 1 replay out or 4 camera iso-records and 2 replay outputs (program and preview or 2 independent programs.) Also supports up to two 3X speed camera iso-records or three 2X speed camera iso-records (DV, AVC-Intra, and DNxHD codecs only). K2 Dyno S Replay Pro Package. Includes K2 Summit 3G 4-channel HD/SD server with DV, MPEG‑2, and AVC-Intra codecs, 12 x 900 GB drives in a RAID-10 configuration for storage, and K2 Dyno S Replay Controller with application software. Supports replay configurations up to 3 camera iso-records and 1 replay out or 2 camera iso-records and 2 replay outputs (program and preview or 2 independent programs). K2 Dyno S Replay Pro Package. Includes K2 Summit 3G 4-channel HD/SD server with DV, MPEG‑2, and AVC-Intra codecs, 12 x 600 GB drives in a RAID-10 configuration for storage, and K2 Dyno S Replay Controller with application software. Supports replay configurations up to 3 camera iso-records and 1 replay out or 2 camera iso-records and 2 replay outputs (program and preview or 2 independent programs). K2 Dyno S Replay Flex Package. Includes K2 Summit 3G 2-channel HD/SD server with DV and MPEG-2 codecs, 12 x 600 GB drives in a RAID-10 configuration for storage, and K2 Dyno S Replay Controller with application software. Supports replay configurations up to 2 camera iso-records and 1 replay out or one 2X/3X speed camera iso-records (DV codec only). K2 Dyno S Replay Controller for K2 Summit K2-XDP and K2 Summit 3G systems. Includes application software and hardware. K2 Dyno S Replay Express Package One. Includes K2 Solo 3G 2-channel HD/SD server with DV, MPEG-2, and AVC-Intra codecs, and K2 Dyno S Replay Controller with application software. 1/2 rack package, 10 hour storage capacity at 100 Mb/s. Includes AppCenter Elite with ChannelFlex, with carrying handle and feet for portable use. Supports replay configurations up to 2 camera iso-records and 1 replay out or 1 2X/3X speed camera iso-records (DV, AVC-Intra, and DNxHD codecs only). K2 Dyno S Replay Express Package Two. 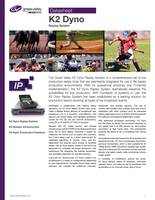 Includes K2 Solo 3G 2-channel HD/SD server with DV, and MPEG-2 codecs, and K2 Dyno S controller. 1/2 rack package, 10 hour storage capacity at 100 Mb/s. Includes AppCenter Pro, with carrying handle and feet for portable use. The Grass Valley K2 Dyno Replay System is a comprehensive set of live production replay tools that are seamlessly integrated for use in file-based production environments. With its operational simplicity and IT-friendly implementation, the K2 Dyno Replay System dramatically expands the possibilities for live production. With hundreds of systems in use, the K2 Dyno Replay System has been established as a leading solution for production teams covering all types of live broadcast events. K2 Dyno Universe replay systems from Grass Valley, a Belden Brand, are optimized for 6X or 4K operation, and they're both fully 6X/4K switchable. What's special about the K2 Dyno Universe systems is that they make 4K and 6X replay much more accessible. For instance, until now, 4K replay would typically require double the number of servers, double the rack space, and double the number of operators in comparison to HD. The result was that 4K replay has been impractical for most events. The LDX 86 Universe "universal format" system camera  capable of 1X 4K/3G/HD, 3X 3G/HD and 6X HD  and two K2 Dyno Universe replay system packages; one optimized for 6X super slow-motion (SSM) but fully 4K-capable and one optimized for 4K but fully 6X SMM capable. With the combined LDX/K2 Dyno Universe, all 4K and all 6X workflows are now possible, with no reduction in the number of cameras and no requirement for more operators (in comparison to HD). A simple menu change switches both K2 Dyno Universe replay systems between 6X SSM and 4K operation. These systems also offer shared sessions with 4K/6X replay to offer multiple angles to operators.